In my previous post, I had talked about the lynchpin for marketing - How to write a good script. Now I will be describing another important part of explainer videos-Professional Voice Overs. A video seems incomplete without a voice over. Your script won’t worth it if it is not narrated properly. Creating a narrated video requires you to focus on many things, for example, quality, pitch, etc. In addition to the script of a video, the audio of a video is equally important as it is responsible for capturing the attention of viewers. Simply, a professional voice over is a voice of your brand, products, and services. If you are a startup and wish to create a compelling profile in the market, integrate explainer videos into your marketing strategy right now. The reasons I have mentioned below help you understand the importance of a professional voice-over in sustaining success and driving sales. A professional voice over actor knows where to pause and where to speak to maintain the essence of the video. This is all about comprehensibility. An uninspiring voice over with boring and lacking tone may frustrate the audience and lower down the overall value of your video. If you want your narrated video to be influential in all respects, the right voice-over actor is a must have to keep viewers stick to your video. The selection begins with the understanding of your audience to get an idea of what type of voice your video requires to capture the attention. The more you understand your audience, the better you will get at selecting a voice that sounds like it, which in return will generate a feeling of belongingness with your brand. How is a professional voice develop trust in your audience for your brand? The right selection of an experienced professional whose voice is confident and credible is likely to generate brand loyalty. Selecting a ‘native’ or ‘localized’ voice should be part of your strategy which has the same inflections, accent, and cadence of your audience. While most brands have witnessed wonders with a professional voice over, a non-localized and common voice make your viewers feel that they are watching a video that is not made for them. Being in marketing for many years, I have learnt that most of the brands aim at driving audiences to act and make a purchase of their services or goods. Guide your voice over actor to address it concisely, no matter what the ‘type’ of the video is and, and what your target audience is. An engaging voice over will keep your viewers stick to your brand while guiding them in the right direction and paving the way for your online presence. A professional voice actor ensures the safety of your video, and hence brand. As he/she will add character and personality to your video, your audience will watch it to the end . An interesting voice over delivers a sense of enlightenment and complexity in a way that your audience frequently visits your video. This will hang on viewers to every word and create brand awareness in the best possible way. The most crucial factor that decides the success of a video is the way it helps viewers to relate to it. It’s about highlighting your brand, and when the quality is high, your audience will watch it to the end, and it will generate interest to learn more about your company and services. To embed the best visuals, you need the experience of a production company and the right equipment to get an ultimate end-product that is an animated explainer video. A voice over should represent the quality and effort you have put into the production of your video to stand it out amongst relative videos. The sole aim behind every brand’s goal is to stick minds of the audience with the video. 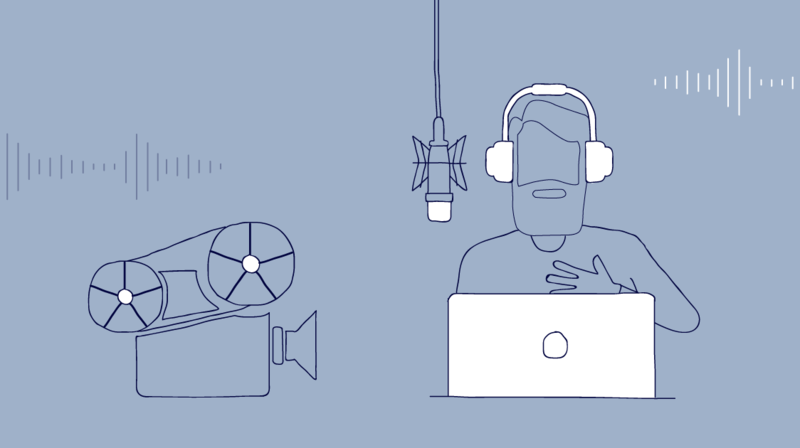 If you want a recognized presence of your brand through explainer videos, then focus on voice-overs. A voice over with a clear voice and professional accent integrates an element of attraction that can give your brand a unique identity. Tip: Choose a voice over actor with whom you can work with for a longer time. This is important to ensure consistency throughout videos; moreover, your viewers would be able to recognize you through a voice over. No matter wherever your voice actor comes from, make sure you select the one who aligns with your needs well. You can find a voice-over actor through different techniques, but using an online platform, can introduce you to thousands of professionals across the world. This type of accessibility matters when you don’t want any delay in the production of your video. This post is a roadmap to a professional voiceover that talks about the importance of clarity in language and accuracy in terminology as per the country in a voice-over to keep the audience engaged and informed throughout the videos.